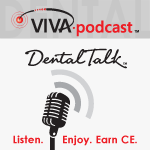 Dental podcast hosted by Dr. Phil Klein: On today's VivaPodcast, we'll be talking about GC Fuji Automix LC, a radiopaque resin-reinforced glass ionomer from GC America. It’s indicated for the restoration of primary teeth, permanent class III and V restorations, core build ups and as a base or liner under composite restorations. To talk more about this product is Dr. Pam Maragliano-Muniz, a prosthodontist who earned her certificate at UCLA School of Dentistry. She maintains a private practice at Salem Dental Arts in Salem Mass and she is on the faculty at Tufts University School of Dental Medicine.